Immune thrombocytopenia is characterized by reduced platelet count. This condition occurs in both adults and children. The most common form of thrombocytopenia is primary ITP and autoantibodies are involved in its development. In this study, our patient was a pregnant woman with ITP who showed refractory to prednisolone and splenectomy as first and second line treatment, respectively, but the response to treatment with Romiplostim and platelet count was favorable, and delivery was reported without fetal complications. Immune thrombocytopenia (ITP), formerly known as idiopathic thrombocytopenic purpura, is an autoimmune disease described by a severe reduction in peripheral blood platelets 1. In thrombocytopenia, the platelet count reaches less than 100 x 109/L 2. Adult ITP has an incidence about 2.0 to 4.0 per 100,000, while in childhood is 1.9 to 6.4 per 100,000 34. The major complications for patients with ITP are bleeding and intracranial hemorrhage 5. Types of thrombocytopenia include primary and secondary ITP. Primary ITP is due to the autoimmune destruction of platelets, which include 80% of the patients. Secondary ITP is related to other conditions such as lupus erythematosus, infections such as HCV and HIV, and lymphoma 6. Also, the acute form is a temporary condition that lasts up to 3 months and mainly affects children, while the chronic form may persist for more than 12 months and affect adults 7. For patients with chronic ITP, there are several treatments that includes corticosteroids, immunoglobulin, splenectomy, and thrombopoietin receptor agonists (TPO-RAs). TPO-RA is commonly used in patients who do not respond adequately to corticosteroids and splenectomy 5. The rationale for selecting TPO-RAs in the treatment of refractory ITP is that the level of thrombopoietin (TPO) is abnormal or low in the patients. Also, the response rates of ITP patients to IVIG and corticosteroids have been reported to be less than 40% 8, while for TPO-RAs, the response rate is reported 59-88% 9. In this study, we have reported a pregnant woman with ITP who was refractory to prednisolone and splenectomy but responded positively to the treatment with Romiplostim. Platelet count: 45 x 109/ L, Hb: 11.6 g/dl, WBC: 12.3 x 109/ L, anti-dsDNA: positive. After several cycles of treatment, CBC results showed refractory to treatment in the patient, and the physician asked for bone marrow aspiration (BMA). The BMA results showed the normal number of megakaryocytes with less platelet attachment. Therefore, the final diagnosis was ITP. Accordingly, the patient's treatment continued with IVIG (intravenous immunoglobulins) (15 g/day), and also due to the presence of lupus, Hydroxychloroquine and Azathioprine (150 mg/day) were used. After 4 months, due to the results of relatively low platelet count and splenomegaly in the patient, the first line treatment failed, and in the next action, she was subjected to splenectomy. Shortly after splenectomy, the patient suddenly decided to be pregnancy. Therefore, according to the patient's condition, treatment with steroid regimens was performed in the first trimester of pregnancy. Also, abdominal ultrasound indicated the progression of normal pregnancy; however, the platelet count did not increase significantly. Since the patient was passing pregnancy and approaching delivery time, the decision was taken to use Romiplostim for her. After three cycles of treatment, the response to treatment was good, and her platelet count was about 164 x 109/L. In the parturition, the platelet count was 75 x 109/ L, and she gave birth to a healthy baby. After delivery, the patient's platelet count was still good, and now the treatment with romiplostim continues for her and the patient is in favorable condition. Patients with ITP have specific characteristics, including platelet count <100 × 109 / L and bleeding. Increased platelet destruction and reduced platelet production are two main mechanisms of ITP pathogenesis 10. In most patients, it seems that platelet destruction is due to the production of autoantibodies and is considered as the most common cause of ITP development 11. The glycoprotein IIa / IIIa on platelets is a target for autoantibodies 4. This mechanism is associated with platelet phagocytosis, and splenic macrophages and neutrophils are involved. Also, there are two factors involved in reducing platelet production: dysfunction of megakaryocytes and the inadequate level of TPO 5. In pregnant women, the incidence of ITP is 7% and the probability of occurrence of pregnancy-related disorders, such as stillbirth, pregnancy loss, premature delivery, and congenital anomalies, is relatively high 12. So, treatment options for these patients are very important. There are three lines of therapies for these patients: In the first line treatment, corticosteroids, IVIG, and anti-D immunoglobulins are approved 13. These factors are used, but due to the limited time of response, they are not considered for long periods. Corticosteroids (such as prednisolone) also decrease the autoantibodies production and inhibit the platelet destruction caused by macrophages 14, while IVIG reduced platelet destruction through binding to Fc receptors in the reticuloendothelial system 15. Splenectomy and Rituximab are considered as the main options in the second line treatment. For patients who have failed treatment with corticosteroids, splenectomy is usually recommended 16. Also, Rituximab, as an antibody, results in the inhibition of B cells by binding to CD20 17. In patients with chronic ITP who have been refractory to chemotherapy regimens such as corticosteroids, immunoglobulin or splenectomy, the FDA has been approved using TPO-RAs, such as Eltrombopag and Romiplostim (Nplate®) 18. These are considered the third line treatment. Typically, megakaryocytes are as the source of platelets, and a chief regulator for the production of new platelets from megakaryocytes is TPO 19. The treatment of ITP with TPO-RAs is performed by activating TPO receptors of megakaryocytes in bone marrow. 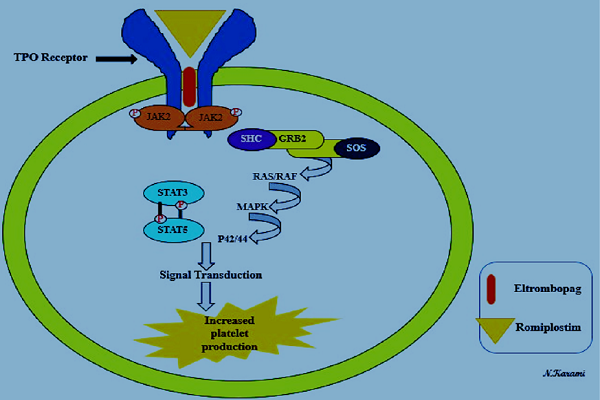 The JAK2/STAT5 and MAPK are the main pathways for the performance of TPO-RAs that enhance platelet count by inducing transcription of the genes involved in platelet proliferation (Figure 1) 20. Figure 1 . Cellular mechanism of Thrombopoietin Receptor Agonists (TPO-RAs). Eltrombopag and Romiplostim, as representatives of TPO-RAs, link to Thrombopoietin receptors and activate JAK2/STAT5 and MAPK pathways. These pathways induce transcription of the genes involved in platelet production, which leads to an increase in platelet count. Nplate® is the commercial form of romiplostim and showed an effective response in both splenectomized and nonsplenectomized patients 21. The safety and effectiveness in increasing and maintaining the platelet count and limited side effects are the benefits of romiplostim 4. The advantages and adverse effects of using romiplostim are presented in Table 1. In the past years, due to a lack of human studies and adverse effects in animal studies, it was recommended that romiplostim should not be used routinely during pregnancy. However, in a few studies, the treatment of ITP patients with romiplostim has been reported during pregnancy without fetal complications 2526. In a case study, ITP was successfully treated in pregnant woman with systemic lupus erythematosus using romiplostim. After delivery, results of CBC showed a high platelet count (202 × 109/L) 26. In the similar study, the patient who has failed in first-line treatment showed an effective response to the drug 25. Similarly, Samuelson and colleagues reported two ITP patients who received romiplostim during pregnancy without severe complications to the mother or the fetus. In the first patient, the use of romiplostim increased the platelet count to 200 × 109/L, and in the second patient, the platelet count reached 184 × 109/L 23. Regarding the risks of ITP for pregnancy, especially hemorrhage, the type of treatment is very imperative in these patients. Because romiplostim directly affects megakaryocytes in bone marrow, it seems to be a good option for the patients who were refractory to the first and second line treatment. Guarantor; Afshin Karami: Concepts, Design, Definition of intellectual content, Literature search, Manuscript editing. Jafar Barati Masgareh: Manuscript editing. Cooper Nichola, Bussel James. The pathogenesis of immune thrombocytopaenic purpura. British journal of haematology. 2006; 133 : 364-374 . McCRAE KEITH. Immune thrombocytopenia: no longer ‘idiopathic’. Cleveland Clinic journal of medicine. 2011; 78 : 358 . Lambert Michele P, Gernsheimer Terry B. Clinical updates in adult immune thrombocytopenia. Blood. 2017; 129 : 2829-2835 . Chalmers Sarah, Tarantino Michael D. Romiplostim as a treatment for immune thrombocytopenia: a review. Journal of blood medicine. 2015; 6 : 37 . Khan Ayesha M, Mydra Halina, Nevarez Ana. Clinical Practice Updates in the Management Of Immune Thrombocytopenia. Pharmacy and Therapeutics. 2017; 42 : 756 . Aboud Nasra, Depré Fabian, Salama Abdulgabar. Is Autoimmune Thrombocytopenia Itself the Primary Disease in the Presence of Second Diseases Data from a Long-Term Observation. Transfusion Medicine and Hemotherapy. 2017; 44 : 23-28 . Stevens W, Koene H, Zwaginga JJ, Vreugdenhil G. Chronic idiopathic thrombocytopenic purpura: present strategy, guidelines and new insights. Neth J Med. 2006; 64 : 356-363 . Sun Dongmei, Shehata Nadine, Xiang Y Ye, Gregorovich Sandra, France Bryon De, Arnold Donald M, Shah Prakesh S, Malinowski Ann Kinga. Corticosteroids compared to intravenous immune globulin for the treatment of immune thrombocytopenia in pregnancy. Blood. 2016; 128 (10) : 1329-1335 . Ghanima Waleed, Godeau Bertrand, Cines Douglas B, Bussel James B. How I treat immune thrombocytopenia (ITP): the choice between splenectomy or a medical therapy as a second-line treatment. Blood. 2012; 120 (5) : 960-969 . Barsam Sarah J, Psaila Bethan, Forestier Marc, Page Lemke K, Sloane Peter A, Geyer Julia T, Villarica Glynis O, Ruisi Mary M, Gernsheimer Terry B, Beer Juerg H. Platelet production and platelet destruction: assessing mechanisms of treatment effect in immune thrombocytopenia. Blood. 2011; 117 : 5723-5732 . Nugent Diane, McMillan Robert, Nichol Janet L, Slichter Sherrill J. Pathogenesis of chronic immune thrombocytopenia: increased platelet destruction and/or decreased platelet production. British journal of haematology. 2009; 146 : 585-596 . Wyszynski Diego F, Carman Wendy J, Cantor Alan B, Graham John M, Kunz Liza H, Slavotinek Anne M, Kirby Russell S, Seeger John. Pregnancy and birth outcomes among women with idiopathic thrombocytopenic purpura. Journal of pregnancy. 2016; 2016 : 8297407 . Provan Drew, Newland Adrian C. Current management of primary immune thrombocytopenia. Advances in therapy. 2015; 32 (10) : 875-887 . Mizutani Hajime, Furubayashi Takayasu, Imai Yumiko, Kashiwagi Hirokazu, Honda Shigenori, Take Hironori, Kurata Yoshiyuki, Yonezawa Takeshi, Tarui Seiichiro, Ikehara S. Mechanisms of corticosteroid action in immune thrombocytopenic purpura (ITP): experimental studies using ITP-prone mice,(NZW x BXSB) F1. Blood. 1992; 79 : 942-947 . Psaila Bethan, Bussel James B. Fc receptors in immune thrombocytopenias: a target for immunomodulation?. The Journal of clinical investigation. 2008; 118 : 2677-2681 . Neunert Cindy, Lim Wendy, Crowther Mark, Cohen Alan, Solberg Lawrence, Crowther Mark A. The American Society of Hematology 2011 evidence-based practice guideline for immune thrombocytopenia. Blood. 2011; 117 (16) : 4190-4207 . Anderson DR, Grillo-Lopez A, Varns C, Chambers KS, Hanna N. Targeted anti-cancer therapy using rituximab, a chimaeric anti-CD20 antibody (IDEC-C2B8) in the treatment of non-Hodgkin\'s B-cell lymphoma. null. 1997 . Imbach Paul, Crowther Mark. Thrombopoietin-receptor agonists for primary immune thrombocytopenia. New England Journal of Medicine. 2011; 365 : 734-741 . Li Junzhi, Yang Chun, Xia Yuping, Bertino Amy, Glaspy John, Roberts Michael, Kuter David J. Thrombocytopenia caused by the development of antibodies to thrombopoietin. Blood. 2001; 98 (12) : 3241-3248 . Tomiyama Yoshiaki. Autoimmune ThrombocytopeniaSpringer: Singapore; 2017. Perdomo Jose. Role of romiplostim in splenectomized and nonsplenectomized patients with immune thrombocytopenia. ImmunoTargets and therapy. 2016; 5 : 1 . Janssens Ann. Romiplostim for the treatment of primary immune thrombocytopenia. Expert review of hematology. 2012; 5 : 133-144 . Samuelson B, Kreuziger L Baumann, Gernsheimer T. Use of romiplostim for refractory primary immune thrombocytopenia during pregnancy. Clinical Obstetrics, Gynecology and Reproductive Medicine. COGRM. 2017 . Kuter David J, Bussel James B, Newland Adrian, Baker Ross I, Lyons Roger M, Wasser Jeffrey, Viallard Jean‐Francois, Macik Gail, Rummel Mathias, Nie Kun. Long‐term treatment with romiplostim in patients with chronic immune thrombocytopenia: safety and efficacy. British journal of haematology. 2013; 161 : 411-423 . Decroocq Justine, Marcellin Louis, Ray Camille Le, Willems Lise. Rescue therapy with romiplostim for refractory primary immune thrombocytopenia during pregnancy. Obstetrics & Gynecology. 2014; 124 : 481-483 . Alkaabi JK, Alkindi S, Riyami N Al, Zia F, Balla LMA, Balla SM. Successful treatment of severe thrombocytopenia with romiplostim in a pregnant patient with systemic lupus erythematosus. Lupus. 2012; 21 : 1571-1574 . Kim Taylor Olmsted, Despotovic Jenny, Lambert Michele P. Eltrombopag for use in children with immune thrombocytopenia. Blood advances. 2018; 2 : 454-461 . Kong Zhangyuan, Qin Ping, Xiao Shan, Zhou Hai, Li Hong, Yang Renchi, Liu Xiaofan, Luo Jianmin, Li Zhichun, Ji Guochao. A novel recombinant human thrombopoietin therapy for the management of immune thrombocytopenia in pregnancy. Blood. 2017; 130 (9) : 1097-1103 . Mehrdad Payandeh, Afshin Karami, Noorodin Karami, Jafar Barati Masgareh, 2018.